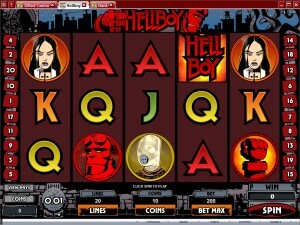 Hellboy is one of the slot machines that Microgaming created under official license, as the main hero is in this case a comicbook character, a superhero that is quite unusual. You may know him from one of the movies that were made based on him, as Hellboy has made the switch from the comic book to the big screen, as many others have done before him. Published by Dark Horse Comics, the comic book chronicles the adventures of a demon that grew up among humans, ever since he was brought to our world by Nazis researching the supernatural. The 5 reels of Hellboy aren’t very crowded, having an average number of lines, 20 total. The features are both regular and out of the ordinary, using wild symbols, a scatter with huge prizes, a bonus feature and a randomly triggered Supermode with free spins. 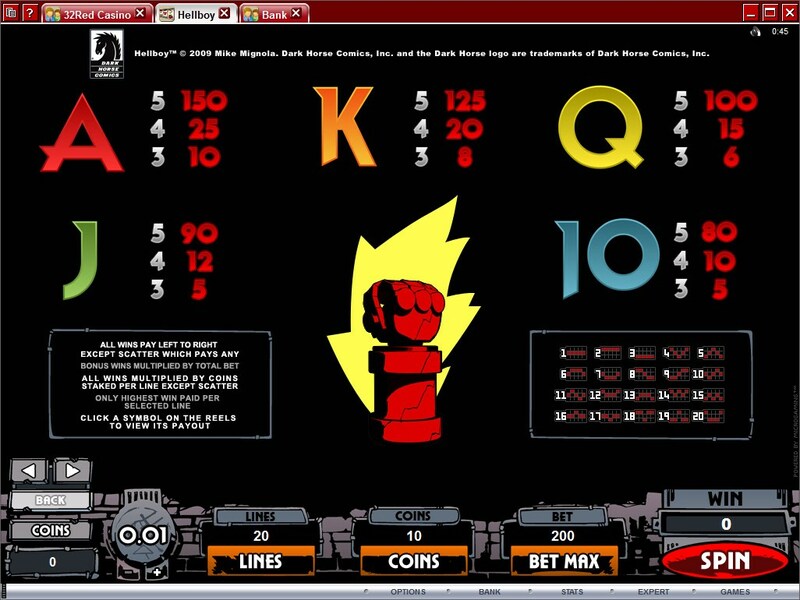 The $25,000 top jackpot awarded by it is the equivalent of 10,000x line bet. 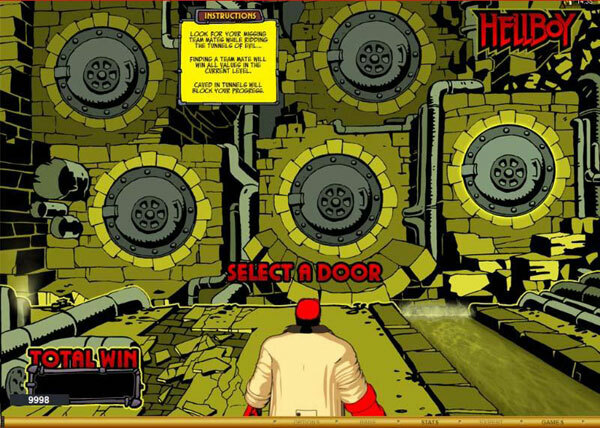 There are some cool features in Hellboy, and I enjoyed seeing that it wasn’t just another slot, and that they actually did something extra to make it even more appealing. 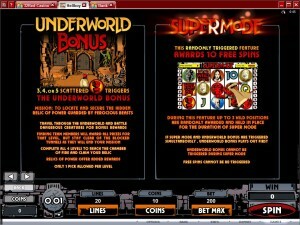 Wild symbols, scatters, free spins and some cool supermodes and bonus games are part of the experience. 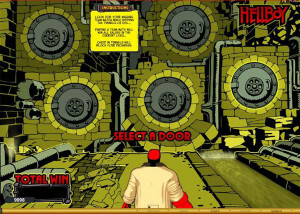 One of the more typical features of Hellboy would be the wild symbol and its multiplier. 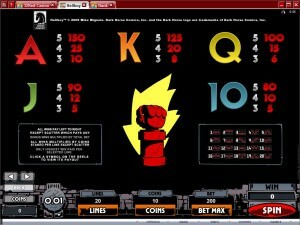 It awards the top jackpot with five Hellboy Logos on the same line, or when it can’t form its own combo it helps others do that. The presence of at least one wild in a new combo will double the prize for it, so it’s always great to have it present, better than having only matching icons actually. The Hand of Doom symbol is the other important symbol, the scatter icon. Scatters are great because there is no requirement for them to form up on a fixed line. Simply having them somewhere on the reels in sufficient numbers is going to be enough. The scatter pays one of the best prizes from this game, the value going up to 500 times the total bet. 3+ Hand of Doom scatters will be required before the Underworld bonus game can be accessed. These are scatter symbols, so they can be anywhere on the reels. The game allows you to go on an adventure, through the underworld, going through various tunnels and looking for a Relic of Power. During each of the four tunnels/levels, you have choices to make, going through doors and trying to advance and get prizes as big as possible. There are three types of outcomes that you can get from each of the five doors that you have to pick from on each level. You select one of them, and you get either the end of the bonus feature, if the Blocked label is discovered, or you can get a monster with a prize, or a friend with a Win All message. The monster gives you only the prize it mentions, and you can then advance to the other level. The friend gives you all the prizes hidden behind doors at that level, and then you can also advance to the next level. The target is to reach a level called Chamber of Fire. There, you have to shoot at a crystal, which will show you a Relic of Power, with a randomly chosen prize offered. The prizes you get in this bonus feature are always multiples of the total bet, so the more you wager, the more you win. This feature is triggered randomly, so it doesn’t have a specific symbol that will activate it. You just need a bit of luck, as you play the game. 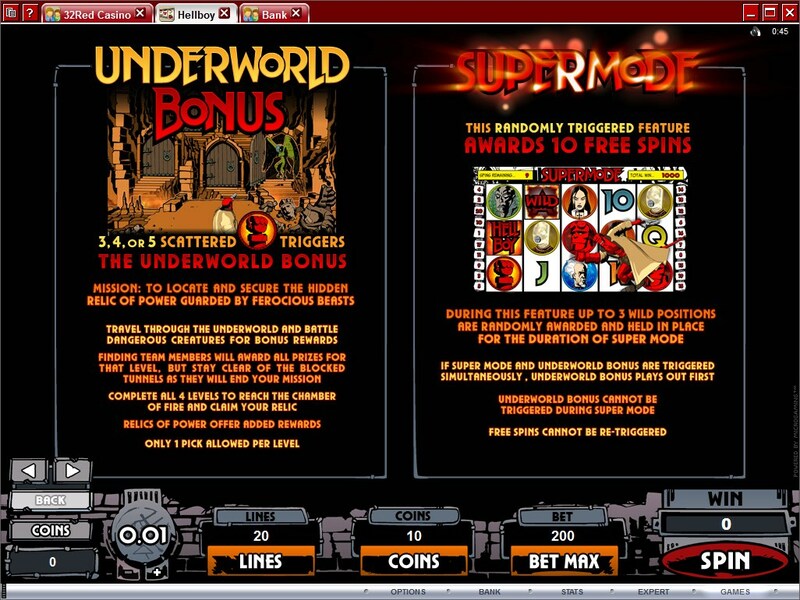 The reward will consist in 10 free spins when the Supermode triggers. Up to three random wilds will be placed on the reels, and they will stay locked in place until the free spins are over. Unfortunately, these spins can’t be retriggered. You can spend anywhere between $0.01 and $2.50 per line, each one getting up to 10 coins, with values of up to $0.25. You can cover all 20 lines with this amount, so the total reaches $50. As for the top rewards of this slot, you can expect up to 10,000 times the line bet, so that would be up to 100,000 coins ($25,000). The scatter symbol offers the same amount, as a 500x multiple that uses the total bet as basis. Hellboy has quite the attractive design, especially since it borrows a lot of things from the comic book version, but there are also some things in it that I’m not a fan of. It’s mostly the plain looking playing cards that I have a problem with, which might have a bit of a special theme to them, but they’re definitely not good enough for a slot machine of this caliber. The symbols are mostly of comic book quality when the playing cards are not involved. It looks gritty and dark, like a Hellboy slot should be, so for the most part they did a good job with it. Symbols: Hellboy Logo (wild, 10,000x), Hand of Doom (scatter, 500x bet), Hellboy (5,000x), Liz Sherman (2,000x), Abe Sapien (1,000x), Johann Krause (750x), Professor Bruttenholm (500x), Ace (150x), King (125x), Queen (100x), Jack (90x) and Ten (80x). 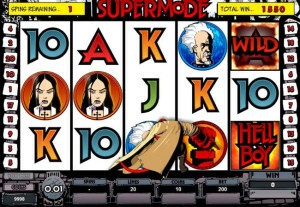 The movies are very good, and the slot machine does quite well also. The design is attractive, the features bring a couple of interesting things along with the usual wilds and scatters, plus the top prize can be won in two different ways. Compared with many other superhero comics, Hellboy is a relatively recent addition to the line-up, the first appearance of this character being from 1993. It was then used in a number of crossovers and mini-series, and just one decade later, in 2004, it got its first feature film. The second one came in 2008. 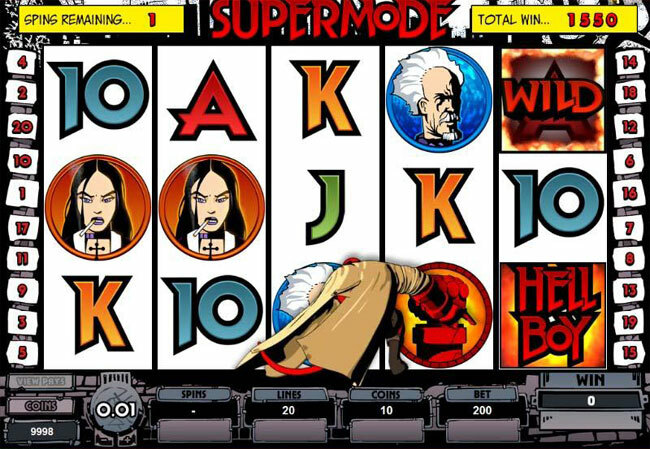 The slot machine focuses on the comic book character, not on the Ron Perlman actor that played him in the movies. The story involves a demon that is called Anung Un Rama, but which humans call Hellboy. He was brought to Earth from Hell, by a ritual that was done by Nazi researchers. He was just a baby demon at the time, but he was raised by a professor from the United States. He is big, red, has horns and a tail, and his feet end with hooves. 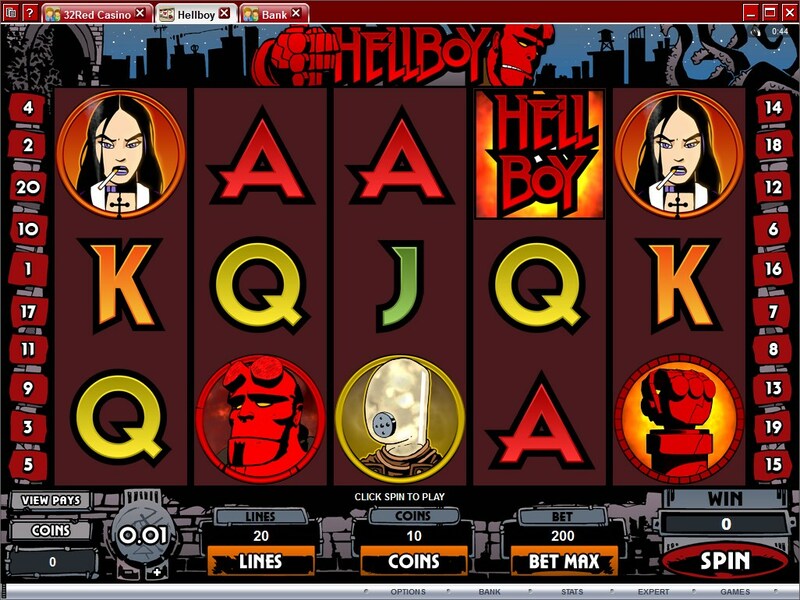 You will find Hellboy at any online casino which chooses to use software from Microgaming, playable either for free or for real money.